Former King of Prussia resident Mary McDonnell returns to her Pennsylvania roots for her debut at People’s Light. Widely known from film and television including her Oscar nominated performance in Dancing with Wolves and starring in Major Crimes and Battlestar Galactica, this is McDonnell’s first appearance on stage in eighteen years. People’s Light continues its 40th Anniversary Season with The Cherry Orchard. 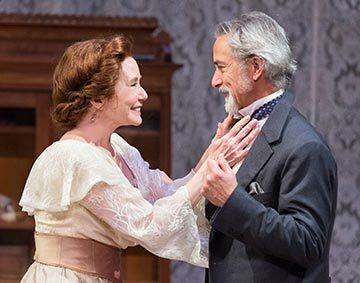 Academy Award nominees Mary McDonnell and David Strathairn join People’s Light company artists in Emily Mann’s acclaimed adaptation of Chekhov’s masterwork directed by Abigail Adams. Playwright Anton Chekhov, one of Russia’s most important literary figures, is best known for his short stories and plays, including The Sea Gull, Uncle Vanya, and Three Sisters. The Cherry Orchard is the most performed Russian play in the world and, written in 1904, it was Chekhov’s last play. It is the story of Lyubov Andreyevna Ranevskaya (Mary McDonnell) and her brother Gayev (David Strathairn) who return home to their ancestral estate just as it’s about to be auctioned to pay a delinquent mortgage. Lopakhin (Pete Pryor), an emancipated serf-turned-merchant, tries to convince Ranevskaya to cut down her family’s beloved cherry orchard and build rental villas, but she will not surrender the symbols of her past, be they beautiful or haunting. Instead, she throws a party for her family and friends and awaits a miracle. Emily Mann’s acclaimed adaptation of Chekhov’s masterwork is directed by Abigail Adams. “This is the kind of writing that interests me most. The mix of detail on the surface and a powerful feeling underneath…Chekhov’s characters rarely speak what needs to be spoken or hear what needs to be heard,” enthused Adams. Former King of Prussia resident Mary McDonnell returns to her Pennsylvania roots for her debut at People’s Light. Widely known from film and television including her Oscar nominated performance in Dancing with Wolves and starring in Major Crimes and Battlestar Galactica, this is McDonnell’s first appearance on stage in eighteen years. Mary is thrilled by the opportunity to perform in a play adapted by her longtime friend, Emily Mann, alongside her daughter, Olivia Mell (Anya), and frequent collaborator, David Strathairn. On screen McDonnell and Strathairn previously co-starred in Passion Fish and Sneakers. 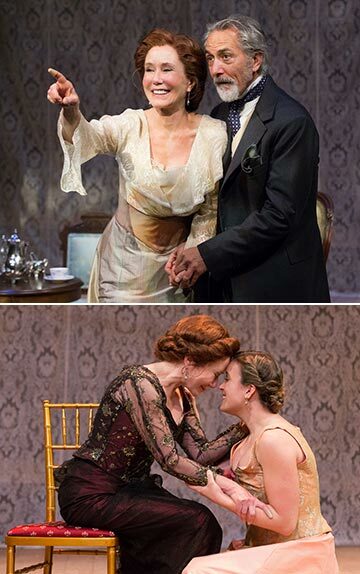 On stage they performed together in Emily Mann’s production of Ibsen’s A Doll’s House at Hartford Stage. David Strathairn last performed at People’s Light in 2009 in Nathan the Wise. The production also reunites McDonnell with People’s Light Producing Director Zak Berkman who has known McDonnell for three decades. “On my first day working at People’s Light in 2011, Abbey and I talked about how to make this project happen.” Berkman recalls. “It is a once in a lifetime occasion to have our remarkable resident company with David and Mary, all these extraordinary artists with such rich histories, exploring together this play that dances such an exhilarating dance with the past”. People’s Light resident company members involved in the production include Peter De Laurier, Andrew Kane, Mark Lazar, Stephen Novelli, Pete Pryor, and Mary Elizabeth Scallen. They are joined by Sanjit De Silva, Claire Inie-Richards, Teri Lamm, and Luigi Sottile. Melissa Dunphy rounds out the ensemble performing live music in her debut as sound designer and composer. The creative team reunites Tony award winner Tony Straiges (Set Design), Barrymore winners Marla Jurglanis (Costume Design) and Samantha Bellomo (Choreographer/Fight Director), and Drama Desk winner Dennis Parichy (Lighting Design). Lee Devin and Gina Pisasale are the dramaturgs for the production. People’s Light continues its Scoop program, now on Wednesdays. Scoop on Wednesdays: History, Context, and Gossip is a lively discussion before every Wednesday 7:30 pm performance (February 25 and March 4). Resident Dramaturg Gina Pisasale will host an artist from the production and get the inside scoop about such things as the rehearsal and production process, design choices, and the world of the play. The program begins at 6:00 in The Farmhouse Bistro. Cost of $15 includes light fare. Call the Box Office at 610.644.3500. Enjoy a prix fixe dinner and a show package for $73 (Wed, Thurs, Sat matinee, Sun eve) and $82 (Fri, Sat eve, Sun matinee) at The Farmhouse Bistro prior to Wed-Sun evening performances. That’s a savings of up to 15% off the single ticket price! If you already have tickets, you can add dinner for just $37. Dinner and a show packages are available through the Box Office or online at PeoplesLight.org. Join us for Love at First Bite at the Farmhouse Bistro Valentine’s Day weekend, February 13-15. Indulge in an incredible three course dinner experience for only $55 per person. Add tickets to The Cherry Orchard for an unforgettable evening. Call 610-644-3500 or visit PeoplesLight.org. The Cherry Orchard is sponsored in part by The Desmond Hotel. The Desmond Hotel is a full service, one of a kind hotel offering superior hospitality and comfort. Experience their beautifully appointed King or Double Queen bedrooms and suites with traditional furnishings, modern technology, free WiFi throughout, deluxe amenities and pleasant views. Book now at www.desmondgv.com. The Cherry Orchard previews on Wednesday, February 11 at 7:30pm, Thursday, February 12 at 7:30pm and Friday, February 13 at 8 pm. The play opens on Saturday, February 14 at 8 pm and runs through Sunday, March 8th. People’s Light is located at 39 Conestoga Road, Malvern, PA 19355. For tickets call 610.644.3500 or visit peopleslight.org.